No, Thumbscrew isn't a gloomy death metal band intent on torturing listeners with the musical equivalent of their namesake. 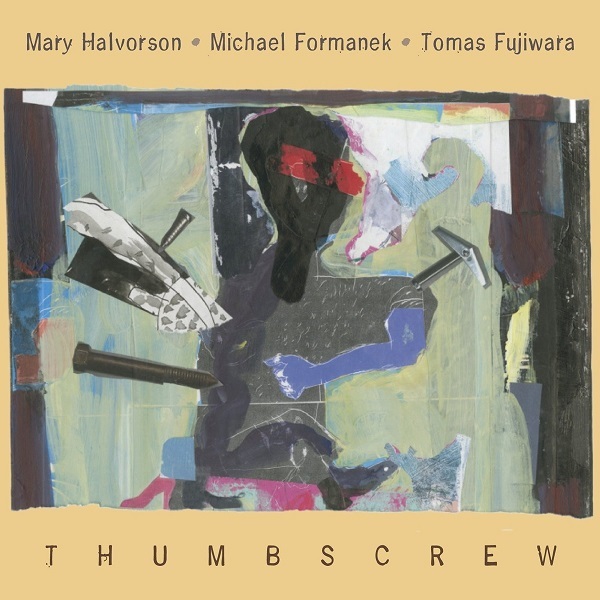 It's an avant-jazz trio consisting of Mary Halvorson (guitar), Michael Formanek (double bass), and Tomas Fujiwara (drums). The group is conceived as a composers' collective, so each of the players is represented by three pieces, but none of them seem very buttoned-down as compositions, allowing a lot of room for the musicians to express themselves. Just by the nature of the instrument, the guitar is going to be most prominent in any trio, and Halvorson's playing is quite distinctive. Most guitarists spend a lot of time and effort getting just the right tone, trying different guitars, strings, amps, and effects devices to present their particular vision of how they want to sound. Halvorson, in contrast, presents a very stark and dry sound much of the time, with little in the way of reverb or sustain, the only effects in evidence being occasional relatively mild distortion and a pitch-shifting pedal that causes her notes to jump around. The overall impression is rather like a classic jazz guitarist gone avant-garde, or maybe like Derek Bailey in a less free mood than usual. Fujiwara ventures seamlessly between swinging jazzy rhythms and freeform parts that always maintain momentum. Formanek complements the tunes perfectly, providing both low end and impressive forays into the higher register. Tonally, the tunes are adventurous, full of interesting twists and turns, even catchy at times without getting predictable; the playing is rehearsed but not constrained, and never delves into self-indulgent technique displays. This guitar trio is about as far from a shredding fusion band as you can get, and a welcome change of pace.